Zach Maynard's ineffective offensive line gave up four sacks for 24 yards on Saturday in the 115th Big Game. 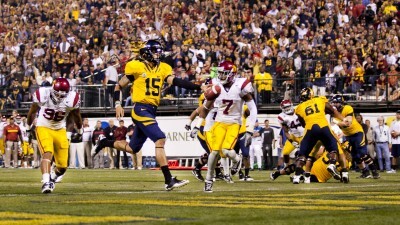 Has the sting of another Big Game loss dulled yet, Cal fans? Probably not. But I’m about to sharpen those pangs a bit more with this week’s installment of Maynard Mondays. 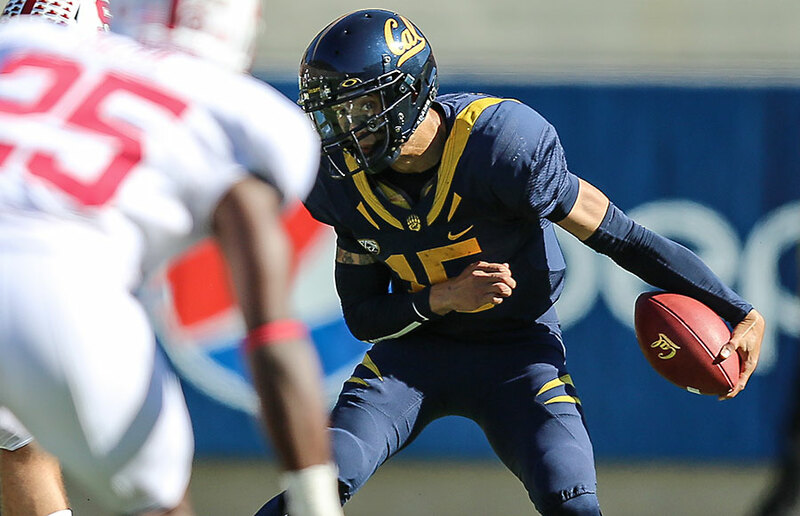 To put it bluntly, Cal’s offense looked pathetic on Saturday. True, its defensive pressure was consistent and stifling; if it wasn’t for that, the battle would surely have been much more of a gladiatorial sacrifice on the Astro Turf of Memorial Stadium. Stanford came into the game with a laughably simple strategy: run the ball, and stop the ball on defense. Game, set, match. The Cardinal came in with a plan, and they executed it to perfection. The team racked up an astounding 252 yards rushing with only 13 yards lost on the ground. 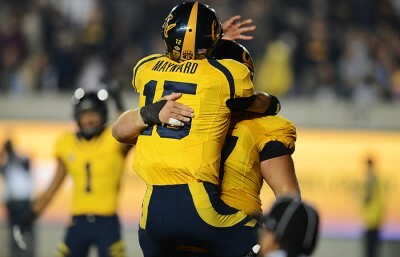 Cal, in comparison, put up three net yards in the run game, with a grand total of 44 yards lost and four Maynard sacks. In short, the Bears’ run game sucked, and the final score is a sobering reminder of that. This was the first Big Game since 1998 in which the Bears failed to score a touchdown, and no amount of Cal spirit and The Play rewinds on Youtube can erase that. It’s hard to say the team lost its spark, because thus far this season it hasn’t really shown any spark or promise. 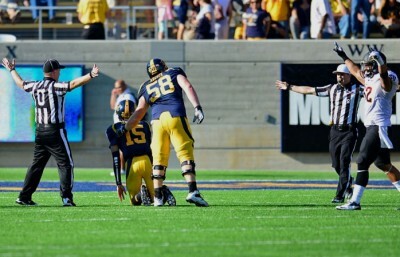 It’s harder to say that the offensive line’s utter absence on Saturday was singular, because the line has largely been the culprit of Cal’s woes this year. The 115th Big Game was like a cruel flashback to the defeats at the hands of Ohio State and USC, in which the line gave up six and nine sacks, respectively. These athletes are supposed to be protecting their leader, their quarterback. Instead, the front seven have less hold and strength than an off-brand Kleenex. Granted, Zach Maynard is no Aaron Rodgers or Andrew Luck, and he’s not going to pull spectacular turnarounds from thin air. But Maynard should be able to consistently drive the length of a field and produce a touchdown in the red zone. And he can’t do that if his team lines up at the three yard-line, poised for its first score of the day, before being driven back for a loss of yards and no dice. There’s some unspoken law that governs the Big Game: anything can happen, right? In Saturday’s case, that anything was just nothing new.